PolitiFact editor: "Tell me where the fact-check is wrong"
PolitiFact Editor Angie Drobnic Holan gave us another stanza of that song-and-dance in a Jan. 26, 2018 interview with Digital Charlotte. Digital Charlotte's Stephanie Bunao asked Holan whether she sees a partisan difference in the email and commentary PolitiFact receives from readers. Well, we get, you know, nobody likes it when their team is being criticized, so we get mail a lot of different ways. I think obviously there's a kind of repeated slogan from the conservative side that when they see media reports they don't like, that it's liberal media or fake news. On the left, the criticism is a little different – like they accuse us of having false balance. You know, when we say the Democrats are wrong, they say, ‘Oh, you're only doing that to try to show that you're independent.’ I mean it gets really like a little bit mental, when people say why we're wrong. If they're not dealing with the evidence, my response is like, ‘Well you can say that we're biased all you want, but tell me where the fact-check is wrong. Tell me what evidence we got wrong. Tell me where our logic went wrong. Because I think that's a useful conversation to have about the actual report itself. 1) "Tell me where the fact-check is wrong"
We've been doing that for years here at PolitiFact Bias, making our point in blog posts, emails and tweets. Our question for Holan? If you think that's a useful conversation to have then why do you avoid having the conversation? On Jan. 25, 2018, we sent Holan an email pointing out a factual problem with one of its fact checks. We received no reply. And on Jan. 26 she tells an interviewer that the conversation she won't have is a useful one? 2) "Every year in December we look at all the things that we fact-check, and we say, ‘What is the most significant lie we fact-checked this year’"
Huh? In 2013, PolitiFact worked hard to make the public believe it had chosen the president's Affordable Care Act promise that people would be able to keep plans they liked under the new health care law as its "Lie of the Year." But PolitiFact did not fact check the claim in 2013. PolitiFact Bias and others exposed PolitiFact's deception at the time, but PolitiFact keeps repeating it. Asked how the media can regain public trust, Holan mentioned the use of transparency. We agree with her that far. But she used PolitiFact as an example of providing readers "extreme transparency." Perhaps PolitiFact provides more transparency than the average mainstream media outlet, but does that equal "extreme transparency"? We say no. Extreme transparency is admitting your politics (PolitiFail), publishing the texts of expert interviews (PolitiFail, except for PolitiFact Texas), revealing the "Truth-O-Meter" votes of its editorial "star chamber" (PolitiFail) and more. PolitiFact practices above-average transparency, not "extreme transparency." And the media tend to deliver a poor degree of transparency. We remain prepared to have that "useful conversation" about PolitiFact's errors of fact and research. You let us know when you're ready, Angie Drobnic Holan. A non sequitur occurs when one idea does not follow from another. A Jan. 23, 2018 fact check by PolitiFact's Miriam Valverde offers ample evidence that PolitiFact has mastered the non sequitur. PolitiFact looked at whether it was true that immigrants cost U.S. taxpayers $300 billion annually. The careful reader will have noticed that the White House infographic did not claim that immigrants cost U.S. taxpayers $300 billion annually. It made two distinct claims, first that unskilled immigrants create a net fiscal deficit and second that current immigration policy puts U.S. taxpayers on the hook for as much as $300 billion. Isn't it wonderful when supposedly non-partisan fact checkers create straw men? As for what the White House actually claimed, yes the Washington Times reported there was one study--a thorough one--that said current immigration policy costs U.S. taxpayers as much as $296 billion annually. We do not know the precise origin of that figure after looking for it in the study. Apparently PolitiFact also failed to find it and after mentioning the Times' report proceeded to use the study's figure of $279 billion for 2013. That figure was for the first of eight scenarios. Was the $296 billion number an inflation adjustment? A population increase adjustment? A mistake? A figure representing one of the other groups? We don't know. But if the correct figure is $279 billion, $300 billion represents a liberal-but-common method of rounding. It could also qualify as an exaggeration of 8 percent. What problem does PolitiFact find with the infographic (bold emphasis added)? A consultant who contributed to the report told us that in 2013 the total fiscal burden -- average outlays minus average receipts multipled [sic] by 55.5 million individuals -- was $279 billion for the first generation of immigrants. But making a conclusion on that one figure is a mighty case of cherry-picking. What conclusion did the infographic draw that represents cherry picking? That line from Valverde does not belong in a fact check without a clear example of the faulty cherry picking. And in this case there isn't anything. The fact check provides more information about the report, including some positives regarding immigrant populations (especially second-generation immigrants), but ultimately finds no concrete fault with the infographic. PolitiFact's charge of cherry picking doesn't follow. In the second paragraph PolitiFact says the fiscal burden amounted to $43 billion "in other scenarios." Put correctly, one scenario put the figure at $279 billion and two scenarios may have put the figure at $43 billion because the scenarios were nearly identical. The study looked at a total of eight scenarios, found here. It appears to us that scenario four may serve as the source of the $296 billion figure reported in the Washington Times. Our conclusion? PolitiFact's fact check provides a left-leaning picture of the context of the Trump White House infographic. The infographic is accurate. It plainly states that it is picking out a high-end figure. It states it relies on one study for the figure. The infographic, in short, provides readers alerts to the potential problems with the figure it uses. That said, the $300 billion figure serves as a pretty good example of appealing to the audience's anchoring bias. Mentioning "$300 billion" predisposes the audience toward believing a similarly high figure regardless of other evidences. That's a legitimate gripe about the infographic, though one PolitiFact neglected to point out while fabricating its charge of "cherry-picking." *I noticed ages ago that the Obama administration produced a huge number of misleading infographics. Maybe PolitiFact fact checked one of them? Correction Jan. 31, 2018: Inserted the needed word "check" between "fact" and "provides" in the fourth paragraph from the end. We say PolitiFact leans left and stinks at fact-checking. We support our point with examples. We admit at the outset that if House Minority Leader Nancy Pelosi's statement is true and leaves out nothing significant then it follows that our example does not show that PolitiFact leans left and stinks at fact-checking. And we assert that our argument will permit no reasonable person to believe that Pelosi left out nothing of significance. Why does CHIP save the government money? In short, it’s because the alternatives cost more. 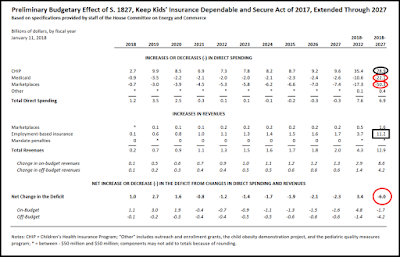 According to CBO, "extending funding for CHIP for 10 years yields net savings to the federal government because the federal costs of the alternatives to providing coverage through CHIP (primarily Medicaid, subsidized coverage in the marketplaces, and employment-based insurance) are larger than the costs of providing coverage through CHIP during that period." PolitiFact has CBO on its side. Game over? PolitiFact wins? Here's the problem: The quotation of the CBO report is itself at odds with the CBO report. On one hand, CBO says "federal costs" of CHIP alternatives come out higher than providing coverage through CHIP. But CBO's explanatory chart tells a different story. It says that costs for CHIP alternatives through Medicaid and subsidized individual market coverage go down by $72.4 billion (red ovals). Over the same 10-year period, CHIP costs go up by $78.9 billion (black oval). On the expense side, CHIP reauthorization increases costs by $6.9 billion. The expense side isn't the only side for the CHIP bill. "Employment-based insurance" accounts for $11.2 billion (black rectangle) in revenue over 10 years. That plus another $1.6 billion from the ACA marketplace brings the total revenue increase from CHIP reauthorization to $12.9 billion. The chart lists $4.6 billion as "off-budget," suggesting to us that the revenue may come from the off-budget Social Security program. The $11.2 billion in revenue accounts directly for the $6 billion "savings" Pelosi touted (red circle), after accounting for the increased outlays. Apparently the "savings" do not come from lower expenses at all. 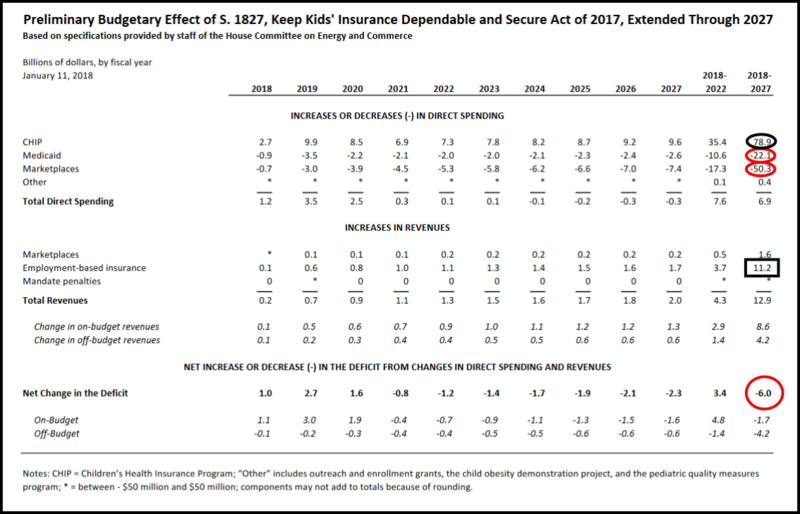 The "savings" come from taking $12.9 billion more for CHIP from taxpayers. And Pelosi's statement told the whole truth with nothing significant left out? We don't buy it. We think any competent journalist should have noticed this discrepancy and addressed it in the fact check. We're not sure if it accounts for any kind of defense for PolitiFact fact checker Louis Jacobson, but his fact check did not directly cite the very clear CBO chart we used above. Jacobson cited a more complex chart (Table 3, Page 4) showing many billions in lost revenue from the suspension of a handful of ACA taxes such as the medical device tax. Even so, how does a fact-checker miss out on the relevance of CBO's plain identification of increased revenue from CHIP re-authorization? Zebra Fact Check picks up the ball PolitiFact dropped by asking CBO to explain to the public the origins of CHIP revenue. When we criticize PolitiFact's subjective rating system, we often see responses like "I don't pay attention to the ratings." We tend to respond that PolitiFact reasons poorly, offering fact check consumers yet another reason to avoid PolitiFact. PolitiFact's January 22, 2018 fact check of Sen. Ted Cruz (R-Texas) helps illustrate the point. The fact checkers use equivocal language and straw man argumentation to support their conclusion. With an end to the federal government shutdown in sight, Sen. Ted Cruz, R-Texas, tried to argue that, contrary to popular belief, he was not the driving force behind the previous government shutdown in 2013. Should we excuse PolitiFact from supporting its claim that most think Cruz was the driving force behind the 2013 shutdown? The 2018 shutdown originated in the Senate, which had a funding bill but no attempt to force cloture before the funding deadline. A cloture vote would have reportedly failed, meaning the Democrats had a modern filibuster going. The 2013 shutdown stemmed from disagreement between the GOP-controlled House and the Democratic-controlled Senate. Back in 2013, Cruz -- then a junior member of the Senate’s minority party -- had tried to end funding for the Affordable Care Act. He pushed for language to defund Obamacare in spending bills, which would have forced then-President Barack Obama to choose between keeping the government open and crippling his signature legislative achievement. As the high-stakes legislative game played out, Obama and his fellow Democrats refused to agree to gut the law, and the Republicans, as a minority party, didn’t have the numbers to force their will. Following a 16-day shutdown, lawmakers voted to fund both the government and the Affordable Care Act. Cruz was widely identified at the time as the leader of the defunding effort. We have two types of defunding going on in PolitiFact's explanation. First, we have Cruz's effort to defund the ACA. Then we have general defunding of the government. See what PolitiFact did there? PolitiFact asserts that most believe Cruz led the effort to defund the government, and slips in the line "Cruz was widely identified at the time as the leader of the defunding effort." Yes, Cruz was the leader, in the Senate, of the attempt to defund the ACA. But defunding the ACA is not the same thing as defunding the government. PolitiFact then included a little tidbit about a Cruz speech on the Senate floor using portions of Dr. Seuss' "Green Eggs & Ham." So it was a Cruz filibuster? Maybe PolitiFact wants its readers to think it was a Cruz filibuster. But it wasn't. “This is not a filibuster. This is an agreement that he and I made that he could talk,” (Senate Majority Leader Harry) Reid said Wednesday. Is there any good excuse for a journalist to offer such a sketchy account of history? PolitiFact was right when it reported that Cruz's proposal to defund the ACA would have forced President Obama to choose between signing a bill that undercut the ACA and allowing a government shutdown. It follows that Cruz was playing the politics of government shutdown, though his method placed the onus on Mr. Obama, and of the two options Cruz would plainly prefer defunding the ACA to defunding the entire government. So even though Cruz's effort to defund the ACA turned out a dismal failure, the effort carried a silver lining for Cruz: Cruz never needed to advocate or support shutting down the government. Given that Cruz voted against the funding bill that eventually ended the 2013 shutdown, PolitiFact had what it needed to show Cruz supporting a government shutdown at least in some form. Instead, PolitiFact opted for a hilarious overreach comparable to Cruz's failed plan to defund the ACA. However, even if, for the sake of argument, you accept Cruz’s line of thinking, his hallway comments offered a very specific definition of determining whether a lawmaker had "consistently opposed shutdowns." Specifically, Cruz said that "only one thing causes a shutdown: when you have senators vote to deny cloture on a funding bill." Cloture refers to a Senate vote to cut off debate and proceed to a bill; it’s a prerequisite for considering a bill, and these days, it typically takes 60 votes. PolitiFact's notion that Cruz defined whether a lawmaker has consistently opposed government shutdowns counts as a fantasy, not a fact check. But for the sake of argument, let us accept PolitiFact's line of thinking. Cruz said a shutdown only occurs when senators vote to deny cloture on a funding bill. In context, his statement obviously means enough senators opposed cloture for the cloture motion to fail. Why? Because over 30 senators can vote to deny cloture and find themselves overruled by the others. And in that case, no shutdown results. But understanding what Cruz said in context will not allow PolitiFact's argument to succeed. PolitiFact can only stick the hypocrisy tag on Cruz if voting against cloture on a funding bill counts as causing a shutdown regardless of the outcome of the vote. So did Cruz ever "vote to deny cloture on a funding bill"? It came on the legislation to end the 16-day shutdown -- a bill that didn’t include the Obamacare defunding language that he had been seeking. If this spending bill didn’t pass, the government wouldn’t be funded and would have to remain closed. As it happened, the bill passed by a large bipartisan majority, but Cruz was one of 16 senators to vote against cloture. He was also one of 18 to vote against the bill itself. Regardless of whether Cruz ever supported a government shutdown, taking Cruz's statement out of context is not the way to make the argument. It's simply a fact that one can vote against cloture on principle apart from a filibuster strategy. Cruz has plausible deniability going for him. Cruz's was one of only 16 voting in opposition to cloture, and it could not be more obvious that such a vote does not meet Cruz's definition for what causes a shutdown. Sixteen senators voting against cloture cannot start a shutdown. Nor can they sustain a shutdown, as PolitiFact's example resoundingly illustrates. PolitiFact altered Cruz's argument in its fact-checking process. These fact checkers stink at fact-checking. When does a politician cast the "deciding vote"? PolitiFact apparently delivered the definitive statement on the issue on Oct. 6, 2010 with an article specifically titled "What makes a vote 'the deciding vote'?" Every example of a "deciding vote" in that article received a rating of "Barely True" or worse (PolitiFact now calls "Barely True" by the name "Mostly False"). And each of the claims came from Republicans. Okay, okay, okay. We have to consider the traditional defense: This case was different! But before we start, we remind our readers that cases may prove trivially different from one another. It's not okay, for example, if the difference is that this time the claim from from a woman, or this time the case is from Florida not Georgia. Using trivial differences to justify the ruling represent the fallacy of special pleading. No. We need a principled difference to justify the ruling. Not a trivial difference. We'll need to look at the way PolitiFact justified its rulings. The NRSC ad would have been quite justified in describing Bennet's vote for either bill as "crucial" or "necessary" to passage of either bill, or even as "a deciding vote." But we can't find any rationale for singling Bennet out as "the deciding vote" in either case. He made his support for the stimulus bill known early on and was not a holdout on either bill. To ignore that and the fact that other senators played a key role in completing the needed vote total for the health care bill, leaves out critical facts that would give a different impression from message conveyed by the ad. As a result, we rate the statement Barely True. (W)e’ll be ridiculously lenient here and say that because the difference between the two sides was just one vote, any of the members voting to adjourn could be said to have cast the deciding vote. The Bruun case doesn't help us much. PolitiFact said Bruun's charge about the "deciding" vote was true but only because its judgment was "ridiculously lenient." And the ridiculous lenience failed to get Bruun's rating higher than "False." So much for PolitiFact's principle of rating two parts of a claim separately and averaging the results. In a campaign mailer and other venues, Ron Johnson says Feingold supported a measure that cut more than $500 billion from Medicare. That makes it sound like money out of the Medicare budget today, when Medicare spending will actually increase over the next 10 years. What Johnson labels a cut is an attempt to slow the projected increase in spending by $500 billion. Under the plan, guaranteed benefits are not cut. In fact, some benefits are increased. Johnson can say Feingold was the deciding vote -- but so could 59 other people running against incumbents now or in the future. We rate Johnson’s claim Barely True. We know from earlier research that PolitiFact usually rated claims about the ACA cutting Medicare as "Mostly False." So this case doesn't tell us much, either. The final rating for the combined claims could end up "Mostly False" if PolitiFact considered the "deciding vote" portion "False" or "Half True." It would all depend on subjective rounding, we suppose. Note that PolitiFact Florida cited "What makes a vote 'the deciding vote'?" for its rating of Gwen Graham. How does a non-partisan fact checker square Graham's "Half True" rating with the ratings given to Republicans? Why does the fact check not clearly describe the principle that made the difference for Graham's more favorable rating? As far as well can tell, the key difference comes from party affiliation, once again suggesting that PolitiFact leans left. After the page break we looked for other cases of the "deciding vote." The NBC sitcom "Seinfeld" featured an episode focused in part on the "Soup Nazi." The "Soup Nazi" was the proprietor of a neighborhood soup shop who would refuse service in response to minor breaches of etiquette, often with a shouted "No soup for you!" PolitiFact's occasional refusal to allow for the validity of an underlying point reminded us of the "Soup Nazi," and gives rise to our new series of posts recognizing PolitiFact's occasional failure to recognize underlying points. We examine the claim in the full context, the comments made before and after it, the question that prompted it, and the point the person was trying to make. Sanders said, "Before the Affordable Care Act, (West Virginia’s) uninsured rate for people 64 to 19 was 29 percent. Today, it is 9 percent." Sanders pointed to one federal measurement, though it has methodological problems when drilling down to the statistics for smaller states. A more reliable data set for West Virginia’s case showed a decline from 21 percent to 9 percent. The decline was not as dramatic as he’d indicated, but it was still a significant one. Sanders' point was the decline in the uninsured rate owing to the Affordable Care Act, and we see two ways to measure the degree of his error. Sanders used the wrong baseline for his calculation, 29 percent instead of 21 percent. That represents a 38 percent exaggeration. Or we can look at the difference in the change from that baseline to reach Sanders' (accurate) 9 percent figure. That calculation results in a percentage error of 67 percent. PolitiFact, despite an error of at least 38 percent, gave Sanders a "Mostly True" rating because Sanders was right that a decline took place. Trump said the Senate seat won by Jones had been "held for more than thirty years by Republicans." It hasn’t been that long. It’s been 21 years since Democrat Howell Heflin retired, paving the way for his successor, Sessions, and Sessions’ elected successor, Jones. We rate the statement False. Can the 14 percentage point difference by itself move the needle from "Mostly True" to "False"? Was Trump making the point that the GOP had controlled that senate seat for a long time? That seems undeniable. Is 21 years a long time to control a senate seat? That likewise appears undeniable. Yet Trump's underlying point, in contrast to Sanders', was apparently a complete non-factor when PolitiFact chose its rating. We say that inconsistency is a bad look for a non-partisan fact checker. On the other hand, we might predict this type of inconsistency from a partisan fact checker. Labels: 2018, Angie Drobnic Holan, Bernie Sanders, Donald Trump, Inconsistency, Katie Sanders, Louis Jacobson, No Underlying Point For You!